A fine place, run by a proud patriot. One of Liberty City's many gun stores, this one is run by someone who gave his all, or at least his arm in fighting for our country. Phil served proudly under the Reagan administration in Nicaragua, where he killed a lot of people he didn't know. He hates liberals. And pinkos. - Official GTA III website. Phil Cassidy's Army Surplus, also called One-armed Bandit's on the official GTA III website, is a compound owned by Phil Cassidy in Grand Theft Auto III, located in north Rockford, Staunton Island, Liberty City. 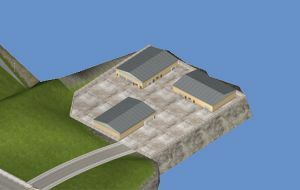 The area consists of military-themed warehouses and is divided into two parts by a moving gate. This gate can only be opened when a military vehicle (either Barracks OL or Rhino) is in front of it, however walking around the building to the right lets you access it on foot. A parked Barracks OL and a Rhino are located behind the gate, though the Rhino is only unlocked after completing the mission "The Exchange." A Hidden Package is located at the northwest corner of the compound. In 1998, the setting of Grand Theft Auto: Liberty City Stories, the area used to be a Ferry terminal but has since been converted into a storage facility. During the mission "More Deadly Than the Male", Phil Cassidy tells Toni Cipriani that he does so much business at the terminal that he should set up there permanently, which is a reference to the fact that he has taken over the area and turned it into an army compound three years later. This page was last modified on 11 March 2017, at 20:30.